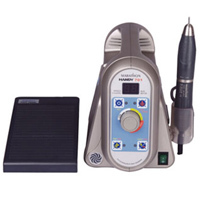 Dental laboratory handpieces and motors are one of the most used equipment in a dental lab; so choosing the best one for your practice should be carefully considered. 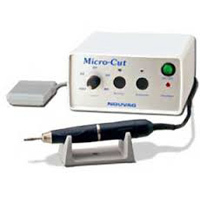 There is a large number of dental laboratory handpieces and their corresponding motors on the market. 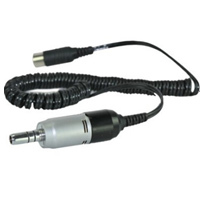 Features vary from handpiece to handpiece but can include; all-in-one turbine, air nozzle and spray, reduced weight and ergonomic design, whisper quiet/ no vibration, high torque, fiberoptics and smooth transitioning while increasing or decreasing rpm’s. When choosing a dental laboratory handpiece and motor, consider what features that will be most beneficial to your dental lab as well as what materials your lab works with most frequently. Most dental laboratory motors come with a corresponding handpiece , however, many vendors also offer a variety handpieces for each motor. 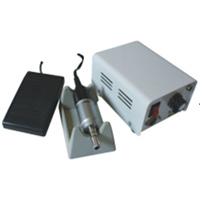 Dental laboratory motors are often controlled via foot pedal, although some do offer a hand dial. If space is an issue, there are wall mounted motors. If mobility is important, there are also lightweight compact motors.